In our last post, we mentioned it was time for us to start expanding into new markets. This week, we refined our search down to a couple of viable options. However, we found that exploring new markets has created a resource issue. How much time should be devoted to exploration compared to time spent working in our current market (university club sports)? We also evaluated two more roadblocks in our system. This first has to do with group hotel room blocks, and the second is with our partners not claiming their cashback. Fortunately, we were able to come up with a couple ideas to test. We’ve recently started to see the quality of new leads in university club sports decline. This is both a success and a challenge. It’s a success because it exemplifies all our work spent securing the top clients in the market. It’s a challenge because we’re now faced with figuring out where to go next. Our ideal new client is a centralized institution that spends $150k+ per year on hotels or micro markets that would match this. Our revenue goal is $50k per month through our new market by the end of the year. This is an ambitious goal, but we believe it's reasonable considering the unit economics. 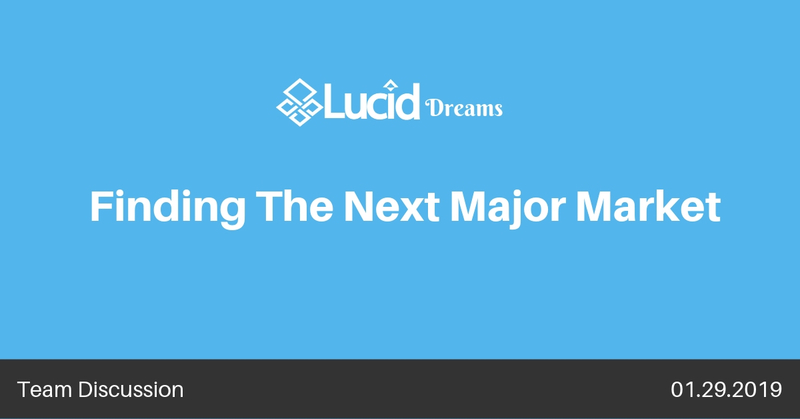 Of course, finding new markets will require time taken away from university club sports... There’s still potential in that market and it has provided Lucid Travel with consistent growth but we believe there are bigger opportunities. Our product has improved drastically and so has our operational structure. To reach our ambitious revenue goal, university club sports won’t suffice by itself. We decided to spend half of our time in university club sports since it guarantees consistent growth and the other half will be spent on customer development (which is really just a fancy term for finding the next market fit). Time management is not doing less or more activity, but managing the quality of activity. It’s asking ourselves, “what specific activities do we need to do to hit our growth metrics?” It’s about solving problems independently for the benefit of the team. And, eventually, it’s about being able to teach someone else about the methods, since teaching creates mastery. Our viable options include private universities of ten thousand students or less, private high schools, Canadian universities, little leagues, little leagues, non-profits, community colleges, and obscure markets like snowboarding/skiing, martial arts, polo, or rugby. We decided that small universities & community colleges are our best options. This type of college still has a spends between $500k and $1M on hotels per year. We wouldn’t have to change our sales process with them, and certainly, don’t have to limit ourselves to their sports department. It’s possible that the sports department isn't even the department that ends up traveling the most. We’d like to encompass the colleges as a whole. Furthermore, we thought we could take the traditional sales approach and visit the colleges in our area. Pitching in person instead of over the phone is something our sales staff would enjoy doing. If nothing else, it’s nice to get out of the office. If you try to book 10 or more rooms per night our software automatically takes you to a group hotel request form (here it is). This tool is awesome if you want to wait for hotels to send you custom bids but it is a cumbersome process and most people would rather book instantly. As a company, we also prefer instant bookings because it creates instant cash flow and requires no service hours to operate. To fix this, we need to create an automated way to book 10+ rooms per night and incentivize it. We’ve also created a travel agent role to facilitate communication between the club sports departments and the hotels. There is also an issue with our cashback feature. First off, the cash isn’t available until after the team goes on their trip. Second, many of our partners aren’t claiming their cashback. We don’t know if they don’t care about it, or if they’ve forgotten about it. Regardless, unclaimed cashback makes us question if this is the driving factor in utilizing Lucid Travel or not. To fix this, we’ve thought about giving them options with their cash back, like giving it to the departments instead of the teams. Additionally, we might put an expiration date on it. This wouldn’t change anything about our business model except making our partners more aware of it. After speaking with several of our existing partners it became clear that cash back was the hook that got them interested & motivated to use Lucid but simplicity & customer service is what makes them stay. As we’ve conducted our market research, we’ve learned that being genuine and curious is key to building rapport and learning about the gaps in their current process. Treating our participants like real people with social lives, personal interests, and emotions can get us a long way. A lesson we learned this week that we’d like to share is that there are two main perspectives in life: (1) Everything matters (2) Nothing matters. We believe that acting as if everything we do (big and small) matters is always a better strategy. Small actions, compounded over time, make big impacts.